Welded installation of casings and tubing has recently become the standard technology for gas storage caverns. But manual welding is very time-consuming. Friction welding technology, however, combines the advantages of the high connection quality of a welded seam with the short time intervals of screwing the casings together. As a result of the many years of experience that UGS GmbH has gained with the running in of welded tubing, funds were raised from the Ministry for Economic Affairs, Energy and European Opportunities of the State of Brandenburg and the EU and a prototype for friction welding was developed, built and put into operation. Gas-tight connections are indispensable for the casing strings for gas storage wells. This particularly concerns the last cemented tubing and the production string. Hand-welded tubing connections in underground storage have proven themselves to be resilient, sustainably reliable and gas-tight. But a great deal of time is required to produce such connections. With friction welding technology, the time requirement for producing a welded tubing or casing connection can be considerably reduced. This not only reduces the rig and work time for running in the tubes. With the accelerated running-in time, casings can also be installed in such wells where the stability of the borehole is critical and, consequently, a short running-in time is an advantage. 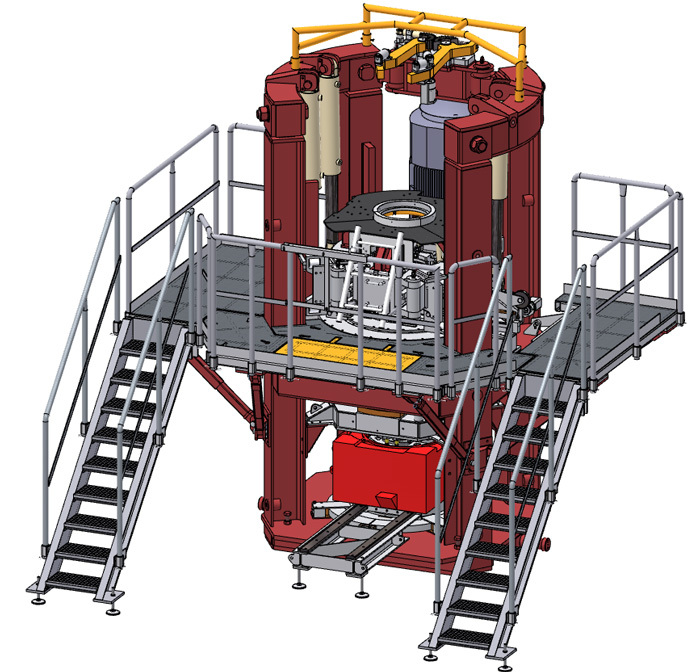 that the friction welding unit should be deployable on a conventional drilling rig and/or workover winch, even in adverse weather conditions. that the time required for the welded connection, including preparatory handling, should be significantly less than for a hand-welded connection. that the process data collected when producing the welded connection must provide feedback on the quality of the weld. The aspiration here is to totally dispense with a conventional, non-destructive welding seam inspection. With the friction welding unit on the test bed, 8 5/8“ tube was successfully tested and integrated. A significantly reduced time requirement compared with hand welding. suitable for the running in of welded tubing into deep and geologically unstable wells. The quality of the welded seam is independent of the abilities and skills of the welder. Friction welding technology can be used on the wide range of material qualities that are in deployment in the oil and gas industry. No special work stage is necessary for non-destructive welding seam inspections. The strength of the friction-welded connections matches the values of the raw material. This provides good resilience with highly alternating stress and powerful bending moments. The heat necessary for joining the two tubes is generated by friction. To do this the tubes to be connected are adjustably aligned against each other in an axial direction. A friction plate is located between the abutting surfaces of these tubes, which is set in rotation by means of a rotary table-type drive. While the friction plate is turning, the two abutting surfaces are pressed against it. The frictional heat this generates leads to the softening or plasticisation of the friction-plate and tubing material. By pressing further, the friction plate material is displaced within the burr edges of the tubes. The friction plate finishes the joining process when it has been completely “rubbed through”. The resulting friction and compression material is separated while it is still in a plasticised state. All the parameters relevant for the process are recorded digitally during the welding process. The assessment of this data, directly after producing the welded connection, produces a statement on the quality of the welded connection without any conventional, non-destructive materials inspections.